Contemporary house of approximately 250 m² located in a privileged and peaceful environment close to the center of Gordes.Large lounge of about 75 m², with fireplace, opening onto a large terrace, equipped kitchen with dining area facing the summer dining room protected by a beautiful wrought iron arbor, scullery / laundry room; bedroom 1 with bathroom, bedroom 2 with shower room and guest toilet.Upstairs, large master bedroom with ensuite office which can become a beautiful dressing room and ensuite bathroom, bedroom IV with shower room.The pool area is located on a higher terrace and is overlooking the property and the valley. There is a 11 x 4.5 meters heated swimming pool with stone paved beaches and equipped pool house (water and toilet). 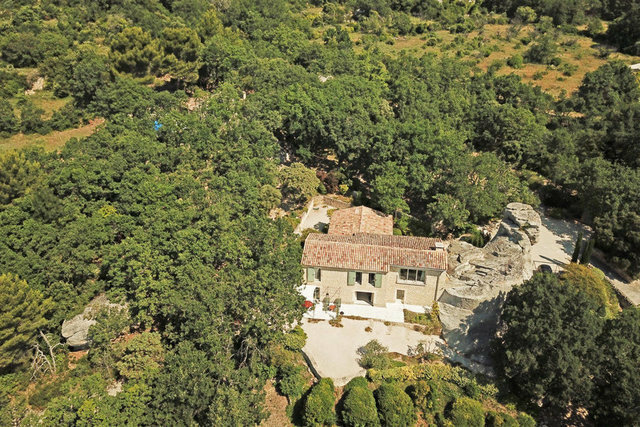 The land of over 5000 m², in domesticated scrubland, includes many oaks, shrubs and ornamental flower beds, large limestone rocks, and offers breathtaking views over the village of Gordes, the Luberon valley and its hilltop villages.